On Sunday, February 23, at 3:00 p.m. the Clay County African American Legacy Inc. will make literacy a significant part of Black History Month by hosting and coordinating a Read-In at Garrison School Cultural Center, located at 502 N. Water Street. Garrison Cultural Center will join over a million readers in the Twenty-Fifth National African American Read-in. 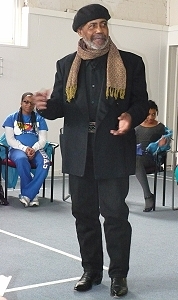 The program coordinator is local poet and playwright, Shelton Ponder; and the event is free and open to the public. To participate, simply select an excerpt from a book, speech, poem, essay (anything authored by African Americans) to share with the public. In 1990, the first African American Read-In was sponsored by the Black Caucus of the National Council of Teachers of English. That same year, William Jewell College held the largest Read-In in the country with over 150 participants. In 1991, the National Council of Teachers of English joined the sponsorship. The Read-In has been endorsed by the International Reading Association. Over a million readers of all ethnic groups from 50 states, the District of Columbia, the West Indies, and African Countries have participated. The goal is to make the celebration of African American literacy a traditional part of Black History Month activities.